Rodney Webb T/as AWEBBCO has been recognised for outstanding achievements in professionalism at the SPASA Awards of Excellence held on 2 June 2018 at the Sofitel Brisbane Central. This award backs up Rodney’s previous wins in 2016 & 2017. This annual SPASA celebration of excellence is a result of months of tireless work. Rodney constantly strives to set new pool and spa fencing industry benchmarks. 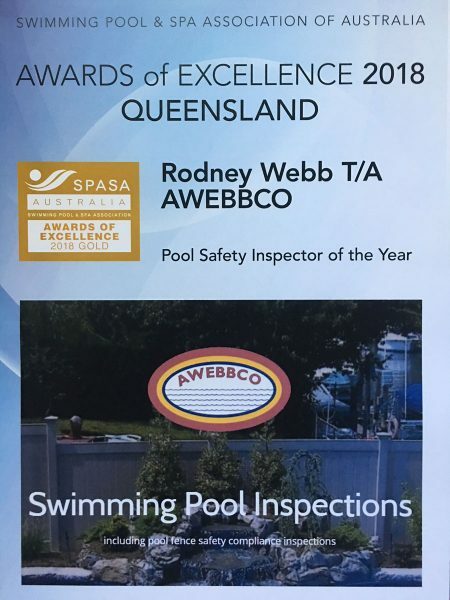 In this year’s judging, Rodney collected the SPASA Australia GOLD Award of Excellence for Queensland Pool Safety Inspector of the Year which reflects his commitment to quality and service. It is the third year in a row that Rodney has claimed the Gold award. The Queensland Government’s pool fencing safety legislation is there for all pool owners to ensure the pool safety of children under the age of 5 years. The SPASA Awards of Excellence are judged by an independent panel of experts. The awards are designed to promote achievement in professionalism across all sectors of the swimming pool industry.